Stinky hot night. I think the low overnight was 25'. Crazy. And it's heading into winter. ?!?!? Another slow morning... did some washing and mopped the floors and had a bit of a tidy up. 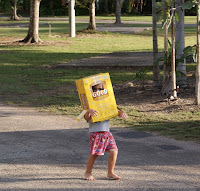 The kids played outside with Jordy dragging his tonka truck around the park and being a robot (in his beer carton box) and Darcy finding sticks and throwing big seed pod balls up and down the streets. I think we were still in the truck on the way into the city again before 10. We are going to save most of the touristy things in here until our weekends off from work. But we'd head around and check out the cheap or free things to do. First stop was the WWII oil storage tunnels. They were dug by hand by over 400 retired men using only chisels and picks and shovels and just two pneumatic drills. It took them 16months and they were finished just as the war came to an end. 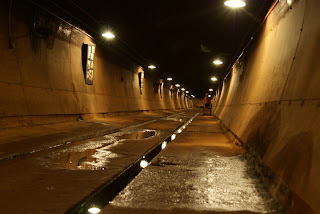 I would imagine that even though they would have been glad the war was over i think that after putting so much of their time and heart into the tunnels they would have been sad to not have them used. After that we were going to stop at Survivors Lookout and Parliament House but we drove past the parking area and figured we'd just keep going someplace else instead. Plus Jordy wanted food. LOL! 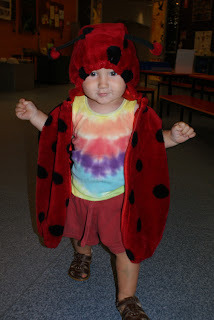 So we went to the Museum & Art Gallery of the Northern Territory.... actually, we went to the cafe out the back first. :) We got a table and sat down before we looked at the menu and, once again, ouch. A burger was $16 and a main was $25... Not to worry, and Jordy would have rioted if we tried to leave, so we had a nice lunch. And, for the first time since chistmas i had a yummy yummy iced coffee. I have to say that the hunt for decent coffee had been futile throughout the Territory but there are nice coffee joints all over the place in Darwin. And i have come to the conclusion that hot coffee is just not the way to go up here. Then off into the museum. And it was a fantastic setup. 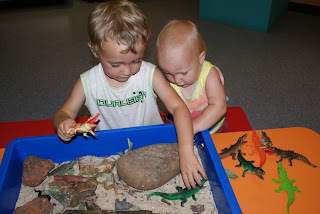 There was a room just for young kids with heaps of displays and bones they could feel and real stuffed animals and a couple of microscopes and fishtank displays and books and colouring in and jars of snakes and big turtles and building blocks and dress ups and if was pretty much adventure-central! 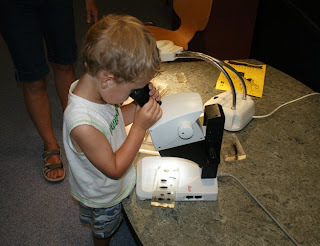 Jordy was enthralled by the microscope and looked at the bugs and lizards for ages. It was a real fight to get him away from it. Darcy loved the animal puppets and crocodile tub. After we finally convinced Jordy that we would come back again to the Discovery Room we got to head into the main museum. Lots and lots to see. The whole set up is great. Everything was really accessible and well set out and just really easy to get involved with. Even Darcy ran around and loved it squealing "dook" at everything and pushing buttons and getting really excited. We did not squeal so much but all the adults were impressed too. The section about Cyclone Tracy was especially good. We spent quite a bit of time in there (and called into the Discovery Room again as promised) and it was about 4pm before we got home. The kids fell asleep in the truck on the way back (i hate that!) so we waited for them to wake up before a swim to cool off again, although with some cloud cover it was not as hot today. Had a good chat with a few other couples travelling around or working in town for a few months. Tim cooked meatloaf for dinner in the weber. After dinner the kids drew pictures for ages and we made a birthday card for Grandpa for tomorrow. Neither of them were tired and were happy to play until after 9pm when Tim and i had had enough and we put them to bed. I think i am now all caught up on the blog! and now i am off to bed as well.